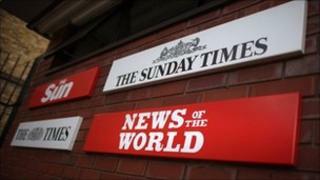 News International is to sell its Wapping site in east London, the newspaper publisher has said. Its stable of titles - which includes the Sun, the Times and the Sunday Times - will be entirely relocated to its nearby Thomas More Square base. The Wapping site was also where the News of the World was based until its closure amid the phone-hacking scandal. The company said "current market conditions" led to a decision "not to proceed with remodelling" Wapping. It said: "The decision to sell the 15-acre site follows a review of News International's London property portfolio. "The majority of News International's Wapping-based editorial and commercial staff have now relocated into Thomas More Square, with the remainder to be relocated by the end of 2011. "Thomas More Square provides the company with excellent facilities and flexibility. As a result, and in light of current market conditions, News International has decided not to proceed with re-modelling the Wapping site." Wapping has been the headquarters of News International's UK operations for 25 years. Long before the current phone-hacking scandal, Rupert Murdoch's papers were at the centre of another controversy - and it made Wapping famous the world over. By moving production of the Sun, the Times, the Sunday Times and News of the World from Fleet Street to a new site in east London, Rupert Murdoch broke the power of the print unions, which for years had resisted new technology. The plant became known as Fortress Wapping, after bloody battles between striking print workers and the police. The move transformed the economics of newspaper publishing, not just for the Murdoch papers but the whole industry. New technology meant fewer staff and larger papers, with full colour and more sections and advertising. But after 20 years, those presses too needed replacing and three years ago printing ended at Wapping when News International opened the world's largest newspaper print plants in Hertfordshire. Most editorial and commercial staff have already moved to new premises nearby. News Corporation, the parent company of News International, announced it was refurbishing the site in September 2008. It planned to create a "new campus" for its UK businesses, including News International, HarperCollins, MySpace, Dow Jones and Fox, and it was envisaged the project would be completed in 2012. At the time, James Murdoch, the boss of News Corporation's UK arm, said: "Wapping is not only important as a physical site, but also it is a symbol of how bold individuals, working together, can advance the world of media and thereby contribute to life in Britain." The BBC's Nick Higham said Wapping became synonymous with Rupert Murdoch's taking on the print unions in the 1980s. "In moving out of there, they are turning their backs on a very, very significant piece of industrial relations and media history." Our correspondent said print unions had "an absolute stranglehold" on newspapers right up until 1980s but Rupert Murdoch had the "guts, the wits, the chutzpah" to "call their bluff". "He built a completely new print works, he sacked all 5,000 of the existing print workers, employed 400 new ones, brought in new technology - and after well over a year of pitched battles with police and pickets outside Fortress Wapping, trying to stop his lorries taking his newspapers out, he finally won and the print unions were forced to withdraw. "And as a result of that, every other newspaper followed suit, they all moved out of Fleet street, they all bought new print works," he said.